Bushy’s housed three bars on Douglas seafront and catered for a diverse bunch – bikers, goths, hippies, lawyers, businessmen, students and housewives all with one thing in common: an open mind to people of vastly different appearance, background and beliefs. The pub is now a local legend. Births, Marriages (divorces) and deaths feature in the memories of many old customers. Some younger drinkers proudly recall the “Last night of Bushy’s” The older ones smile and quietly recall the First (and subsequent) Nights – and early mornings, for that matter! The pub was full of nick-nacks ranging from a red phone box, a miniature railway that chugged around the room at picture rail level, a statue of Liberty, a Ford Anglia juke box (majoring in the stuff that “Heartbeat” plays every episode) rare motorcycling memorabilia and a Tardis (Don’t ask). The concert room witnessed some amazing nights of live music, featuring Steve Gibbons, Supercharge, the A-Team, Thunderbird 7,and Joe Public amongst others and comedy shows, which saw appearances of Jack Dee, Lee Evans, Hattie Hayridge ,John Hegley, Jo Brand and Jeremy Hardy – and, of course, that arch-nutter Frank Sidebottom. 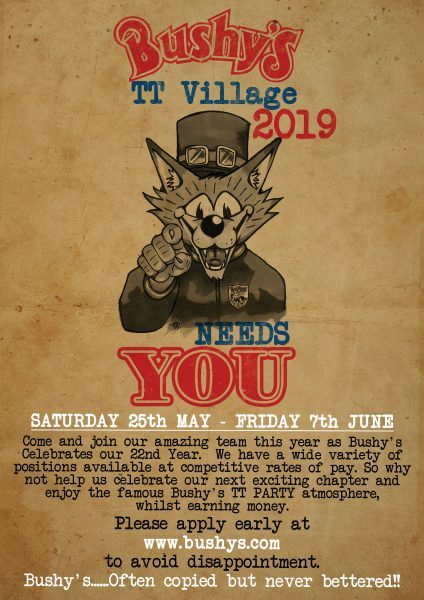 Over the years, Bushy’s developed into a major TT attraction, both inside and out! Sadly, the lease expired in 1998, only for the “suits” to move in with their wads of wonga and laptops etc. ready to sell you loans and insurance policies. 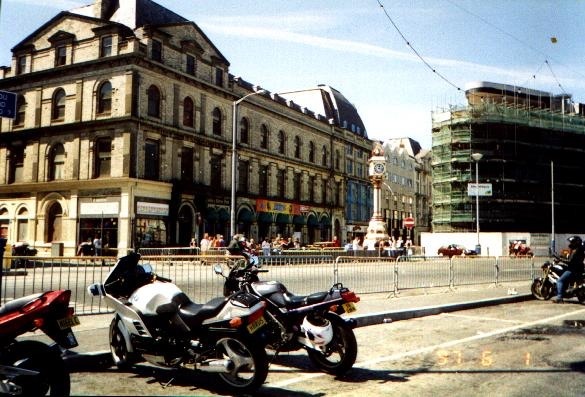 During the TT the vast crowds would still fill not only this area but the streets around, despite the fact that Bushy’s was no more. 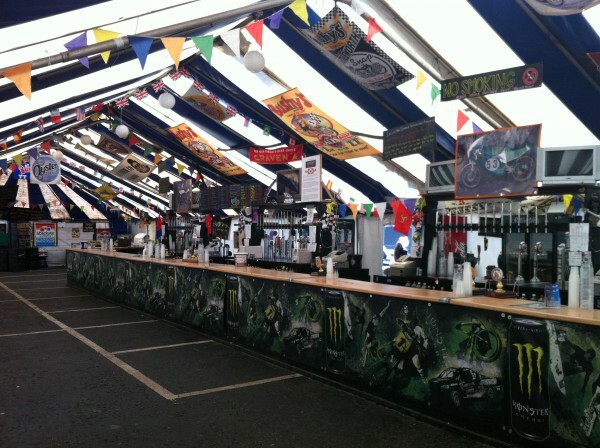 It was agreed that something had to be done and with considerable foresight, boss Martin suggested a Bushy’s Beer Tent could be erected opposite the old building. The vast marquee is now as much a part of the TT festival as the old pub was. 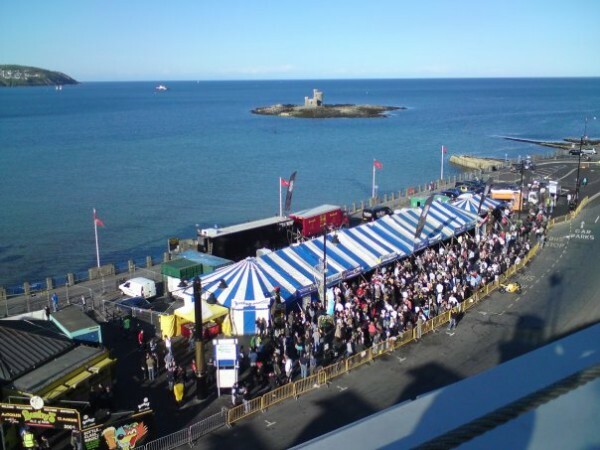 Race week sees all sorts of events staged in the area and the crowds keep coming! How often do you see a brewery boss drinking or working in one of their pubs? Go on, think about it!